By Robert Kahn, P.E., RK Engineering Group, Inc. In the fall of 2007, I visited Paris, France, where I was introduced to the Vélib’ Bicycle Sharing System. At that time, Vélib’ included approximately 10,000 bicycles with 750 docking stations, which has since expanded to include over 20,000 bicycles with 1,451 docking stations covering the entire City of Paris. Vélib’ is a short-term bicycle rental system that allows users to make relatively short trips of 30 minutes to an hour instead of using other modes of transportation (i.e., auto, public transit, taxicab, walking, etc.). Bicycle sharing is not geared towards longer distance recreational trips and generally serves local trips to work, shopping, and nearby destinations. In an April 2008 article published by WesternITE, I provided a detailed discussion of the Vélib’ program. At that time, a limited number of bicycle sharing programs were available in the United States (U.S.), but numerous cities were contemplating their use in the future. Many cities, including Washington, D.C., wanted to implement similar systems in their communities to help promote the use of bicycling as an alternative mode of short-term transportation to replace automobiles, public transportation, taxis, and walking. Between 2007 and 2012, bicycle sharing in the U.S. has expanded substantially in many cities and universities. This article documents some of the current and proposed programs being implemented throughout the U.S. and is primarily limited to local public agencies; however, numerous university programs are in operation and are successfully used by students and staff in lieu of other transportation modes. Most bicycle sharing systems in the U.S. are currently run and operated by private companies, who provide the physical hardware, bicycle monitoring systems, docking stations, and maintenance/operation; they collect a portion of the fees collected through subscriber usage of the bicycle sharing systems. Some financial return to the local agencies is also provided on a case-by-case basis. 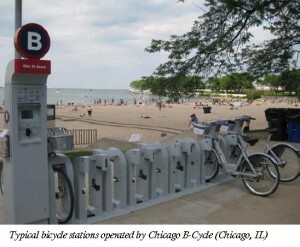 Currently, there are at least 19 U.S bicycle sharing systems in operation or that will be implemented shortly in 2012. In addition, there are numerous university systems in operation, including Kent State University, Oakland University, University of California, University of Mississippi, University of Tennessee, and Washington State University. The advantage of the university bicycle sharing systems is that the travel areas where the bicycles are used are relatively small and trip lengths are usually shorter than within an entire city. Also, students are accustomed to riding bicycles and have fewer automobiles available to them. The universities are implementing their own programs for students and university staff, which will serve local trips around the universities. There are numerous benefits that occur as a result of a bicycle sharing program. An effective program will reduce dependency on the automobile and increase mobility to the public. This in turn will improve the environment by reducing air emissions and greenhouse gases. This strategy is in keeping within current policies for sustainable communities and air quality regulations. Bicycle sharing programs also provide an affordable transportation alternative. Annual subscription fees and usage charges are low and affordable to all economic sectors, which may not be able to afford other transportation alternatives, such as the automobile, public transit, or taxis. It reduces the need for individual bike ownership, thereby eliminating the need for individuals to purchase, maintain, and store personal bicycles. By limiting automobile trips, especially in downtown areas, parking demand will be reduced, therefore less onsite and street parking will be needed. Bicycle sharing programs will also have substantial health benefits to the public. A large portion of the American society is overweight and bicycle sharing provides the opportunity for increased physical activity throughout the day. By using bicycle transportation, walking will also be encouraged to access the bicycle sharing docking stations along with a person’s final destination. Reducing the use of automobiles will also have benefits in minimizing traffic congestion, especially in high-density areas, which currently have traffic capacity issues. Bicycle sharing programs will also create new jobs for the rental service and bicycle maintenance. Finally, the program introduces people who would not typically utilize bicycles as an alternate means of transportation. The number of bicycles currently in operation or planned varies tremendously between individual bicycle sharing programs. The number of bicycles is as low as 12 to 14 in the Hawaii B-Cycle (Kailua, Hawaii) and Spartanburg B-Cycle (Spartanburg, South Carolina) programs, to as many as the projected 10,000 bicycles in the New York City Bike Share program. The number of stations also varies considerably among different programs. There are as few as one docking station in the Bright Angel (Grand Canyon, AZ) program and two stations in the Hawaii B-Cycle and Spartanburg B-Cycle programs, and as many as 600 stations planned to be implemented in the New York City Bike Share program. Typically, there are approximately ten bicycles per station for most of the bicycle sharing programs. The Vélib’ Bicycle Sharing System provides a much more intense number of bicycles per docking stations and their usage is substantially greater than any of the existing or planned U.S. bicycle sharing systems. This is primarily due to population density, traditional use of bicycles for commuting, and the fewer number of automobiles per person in the Paris area. It should be noted that many of the U.S. bicycle sharing systems close during inclement weather periods in the winter months, usually between December and March to avoid the cold, wet, and snowy seasons. During these months, bicycle use is not possible given the weather conditions. The Paris system also sees a drop in usage during heavy weather, but they are still open during these periods. 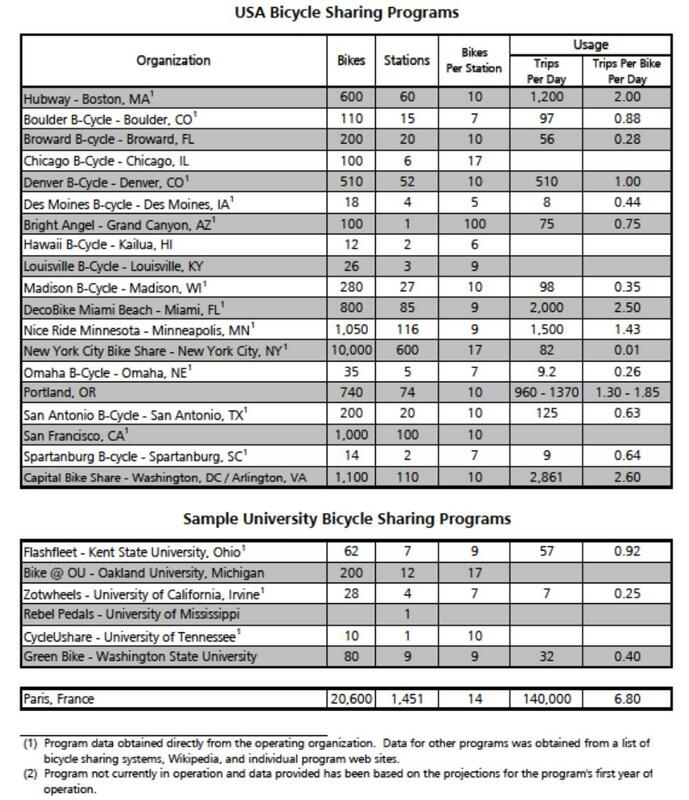 The average number of trips in the U.S. bicycle sharing programs varies substantially by the size of the program. A low of eight trips per day was reported from the Des Moines B-Cycle (Des Moines, IA); whereas up to 2,000 trips per day have occurred in the Deco-Bike system (Miami, Florida) and approximately 2,861 trips per day have occurred in the Capital Bike Share program (Washington, D.C. and Arlington, VA). One interesting operating system characteristic is the number of trips per bicycle per day for each of the bicycle sharing programs. On the low end, a trip rate of 0.26 trips per bicycle per day has occurred in the Omaha B-Cycle (Omaha, NE) program, whereas 2.5 and 2.6 trips per bicycle per day have occurred in the Deco-Bike and Capital Bike Share programs, respectively. This utilization rate is still substantially lower than the trip rates being achieved in the Vélib’ system, which has produced nearly 6.8 trips per bicycle per day. What Makes for a Successful Bike Sharing Program? 1. There must be ample coverage of docking stations and bicycles throughout the service area. The system can be phased over time; however, high usage areas should be identified early in the planning process. Key high-density residential and destination areas, such as employment and retail centers, need to be serviced in the program. 2. The area should be served by a good system of bicycle paths, on-street bicycle lanes, and bicycle routes within the community. This should provide connectivity throughout a community where the bicycle sharing program is implemented. 3. Terrain must be considered in the bicycle sharing service area. Since most bicycles used have limited capabilities with respect to gearing and weight, hilly communities may not be best served by bicycle sharing systems. 4. Higher density population areas – employment and other attractions – must be served. A review of demographics within the service areas needs to be considered in advance of implementing any programs. 5. A key element to a successful bicycle sharing program is ensuring that it is run by an experienced, well-funded system operator. At the present time, there are a number of these companies that have successfully implemented bicycle sharing systems throughout the U.S.
6. Use of the system must be simple and should charge relatively low fees for both the annual subscription and user charges to attract the most possible users within the service areas. 7. The system must be well-maintained to ensure that the bicycles are always available within the community. An effective maintenance program is a must, since poorly maintained bicycles will definitely affect system usage. 1. throughout the day to meet the changing demand within the service area. This has been employed in the Vélib’ system. 2. An active public information program for the bicycle sharing system is imperative. The public information program should identify the docking station locations, bicycle availability, and how the system works. This requires an active marketing program in the community; web-based information systems are extremely important. The use of smart phone applications to provide information on the docking station locations and bicycle availability is an important component of a successful system. 3. There is a need to have a plan-phased program expansion to show how the system will serve other areas of the community in the future. A small area system can be implemented; however, information on future expansion should be disseminated to the public to show how the system will serve the community in the future. These factors will all help maximize the use of the bicycle sharing system and its future success. Where Are Bicycle Sharing Programs Going? Bicycle sharing programs are continuing to expand substantially in the U.S. Since 2007, when nearly no programs were in existence, bicycle sharing programs have expanded in many metropolitan areas, with nearly 20 programs by the end of 2012. Substantially more programs currently exist at various universities throughout the U.S. Three new systems (San Francisco, Portland, and New York City) will be in operation in 2012 and additional operational data regarding these programs will be available by the end of 2012. As people become more familiar with bicycle sharing systems and a greater number of bicycles become available, their usage will substantially increase. Also, as programs expand, the number of trips per bicycle per day will also increase. Since the urban density in most U.S. communities (typically 10,000 to 26,400 people per square mile) is not nearly as high as in Paris, France (53,883 people per square mile) or many other European cities, usage levels may not reach the higher levels currently being seen in these high-density cities. However, it is anticipated that through program expansion, additional marketing efforts, and increased system coverage, bicycle sharing in the U.S. will substantially expand in the near future. Marketing of bicycle sharing programs is very important to their successful operation. Radio/television ads will enhance the understanding of the systems, but web-based marketing is also critical in publicizing the program to potential users. All of the current/proposed U.S. bicycle sharing programs have active web sites to provide critical information to potential system users. This includes the number of bicycles/docking stations, how to use the system, location of the docking stations, and other frequently asked questions. Potentially, the best marketing practice is operation of the bicycle sharing program itself. As bicycles and docking stations appear in a community, they will act as their own advertising system to the local potential users who take interest in the program. The expansion of the program will then allow an added level of convenience and availability with an increased number of bicycles and docking stations within their community. This marketing technique is the main reason for Vélib’s success, since their bicycles are visible everywhere in the city. Likewise, as more bicycle sharing programs are expanded, increased usage will occur throughout the U.S.